The latest installment of Connelly's Harry Bosch crime series, in which the recently retired detective must track down a man who may never have existed. This latest Bosch outing is its own accomplishment: brooding and intricate, suspenseful and sad. In short, it’s another terrific Michael Connelly mystery ... Because Connelly is such a hardboiled master, he casually sidesteps the usual narrative convention and does not intertwine these two plots. Instead, readers experience the stressful chaos of Harry’s overloaded and divided life. Connelly is an old hand at weaving together several major plots. The two he creates in The Wrong Side of Goodbye are just the kind of plots that make the Bosch books so irresistible: They combine the procedural, with its emphasis on the detail-oriented mechanics of investigation, with engaging human stories to which both Bosch and the reader connect. Sometimes an investigation turns on something as small as a still-warm bag of fast food or that solid-gold pen; sometimes what leads Bosch to the truth is his talent for seeing into the human heart, for good or ill.
...readers will appreciate Harry Bosch not only as an intrepid investigator but a man whose identification with and allegiance to society’s underdogs make him acutely aware of prejudice against Latinos and homosexuals ... While The Wrong Side of Goodbye may not stand shoulder-to-shoulder with some of the stronger entries in the Bosch oeuvre — or boast the high-octane, blood-spattered crimes — it is immensely satisfying to see Bosch’s sustained and deepened passion for his mission undiminished by age or circumstance. 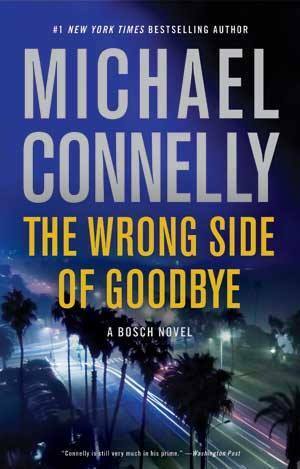 What did you think of The Wrong Side of Goodbye (A Harry Bosch Novel)?